17th/18th c, pine, mineral pigments. Rare as not many “torgams” survived; unique form and interesting auspicious decorations. 21½” h. 10¼” w. 14½” d.
A torgam is a type of cabinet used to store ritual offering cakes called “torma.” This one is an extremely rare piece because not many of this type of religious relic survived, and also because of its form and auspicious painted decoration. 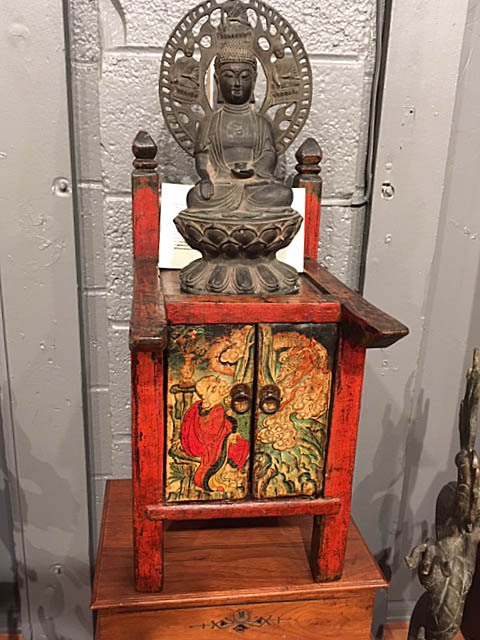 It has a scalloped back panel at the top but no side ones and seems to function as a platform for a Buddha statue. The double-doors compartment below is for holding offering cakes. The vividly colored paintings seem to tell some folk stories, maybe of some fortuitous encounters that bodes good fortune and longevity, as indicated on one panel by a deer and cranes on another; the appearance of a dragon to a scholar, is a sign of achieving high status, and cloud-forms signify wishes to rain down from heaven. This attractive torgam was likely commissioned by a person of high rank to be placed in a private chapel dedicated to some guardian deities in his home. 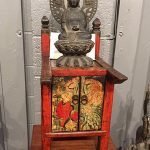 It would be an altar on which a deity figure would be placed for worship. Such an altar/cabinet is hard to find today as most would not have survived the ravage of cultural revolution the country encountered.